My Algebra students will begin a mini-unit on square-root functions after their exponential functions test on Monday. Here is the “anchoring activity” they will explore when finished with the test. I can’t stress enough how helpful it is to have a tool like ThingLink available for those weird class times when some students are finished, others are still working, and a new unit is on the horizon. Creating ThingLinks helps “pre-teach” so I can do justice to a new lesson the day after a test. It’s a “mini-flipped” lesson, and I plan to continue creating and utilizing ThingLinks this way. Added bonus: students return to each ThingLink as an interactive study guide toward the END of each unit, and can cumulatively review all ThingLinks to prepare for end-of-the-year exams. Here you go – Square-Root Functions 101! 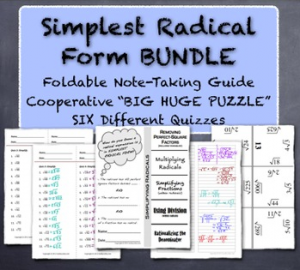 And when your students are ready to tackle “Simplest Radical Form” here are some resources to help them with fluency and to facilitate communication and collaboration! Check out this doc for more ideas! This entry was posted in Algebra 1, Pre-Algebra and tagged Algebra, anchoring activity, square root, thinglink. Bookmark the permalink.